disclaimer: not meant to be comprehensive or scientific in any way, this post just consolidates my impressions while traveling through brazil, argentina, and uruguay in the summer of 2011, plus my experiences from ecuador, where i’m from. it is a response to my concern with the tendency to generalize slums as sites of democracy and political horizontality. my intention here is to problematize that misconception and to show how property ownership and land occupation alter the ways in which slums operate, although my knowledge of these sites is uneven. 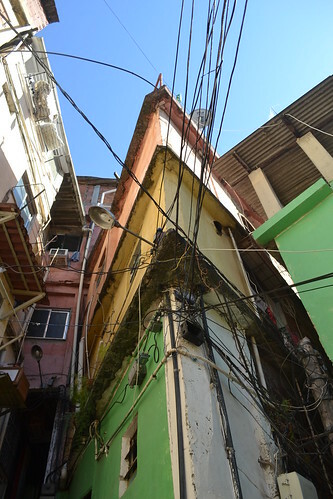 the favela tour in rio (as awful as it sounds) actually managed things very gracefully—by the simple act of not allowing pictures of people, the whole thing worked out better than i expected. they took us to rocinha and canoas, two older and well-established favelas in the morros, the very steep hills that you can see in most rio de janeiro postcards. the morros are quite beautiful, right against the backdrop of the ocean, and understandably the images of the favelas there have become incredibly seductive for designers. this is design from the bottom-up, design of the people—in contrast to the monotone aesthetic of brasilia, the favelas offer the alluring appearance of democracy and collaboration. i found my guide’s pink-colored vision of the favela system hard to believe, but it might be true. she said the brazilian state is supposed to take care of housing according to the constitution. since they don’t, they allow the appropriation of the public land in the morros. each favela is governed by either drug lords, policemen, or former policemen-turned favela lords, crime being higher outside than inside favelas because of their tight control. some are being intervened in advance of the brazil world cup/olympics extravaganza coming up. the following day i saw some favelas on my own as i walked to pedregulho—but these were not the colorful and picturesque favelas of the morros. like most of the slums surrounding rio, these are makeshift settlements sprawling around major highways, with all the inconvenience of long expensive commutes. they reminded me of the slums in guayaquil—some smaller pockets were also much more precarious and similar to what i am used to considering slums, versus the concrete block buildings of the more established, older favelas. similar to rio, slums in guayaquil (ecuador) started in the hills (not as high and dramatic as the brazilian ones) but once those were gone, they spread to the periphery. they are now eating up the valuable mangrove that originally acted as the land’s natural protection against seasonal floods, a porous barrier that—as slums are legalized—is being transformed into cement and man-made drainage that is often not enough to resist the floods of el nino. thus while the city depends on the slums as it houses its workforce, the gradual legalization of the land and improvement of their conditions contributes to an ecological threat. the land occupation problem in guayaquil is well-known to all. slums are usually not in public land: they occupy very large properties, usually old farmland that has been absorbed into the city’s periphery. the illegal occupation of the land is not free—land sharks sell the land in advance and organize the settlers to take over, usually overnight. this is not bottom-up urbanism, but organized control in which the settlers have little say. the organization that results is a sprawling, thin layer that spreads, rhizome-like, beyond the horizon. it is also a political problem—these large populations are coerced or seduced into voting blocks, and controlling the land also means controlling the politicians that get elected thanks to it. far from an exercise in democracy, it is often the authority of capital that decides elections. buenos aires is a great city—a large core of apartment buildings with retail in the lower floor, with a surprising amount built in the 1930s and 40s. it is both modern and urban—rationalist buildings squeezed into mostly dense, walkable streets, albeit with some mega-avenues that don’t make much sense except as vanity projects. it is only when you leave the city that you first encounter slums. the only one i saw within the core is right next to the bus station, but once outside, they are a reflection of the horizontality of the pampa landscape—if slums in rio and guayaquil are sprawling, they still obey the logic of the grid—the sign of planning. outside buenos aires, they seemed strewn around, almost like the result of a natural disaster. as the bus leaves the city, you can see them loosening. i walked through a small settlement outside montevideo, in uruguay that had similar characteristics (again looking for an architectural site)—it seemed more like a rural town intruded upon by a large highway. these slums seemed to hover in some limbo with the worst qualities of both city and country: pollution mixed with sprawl and distance to basic needs. 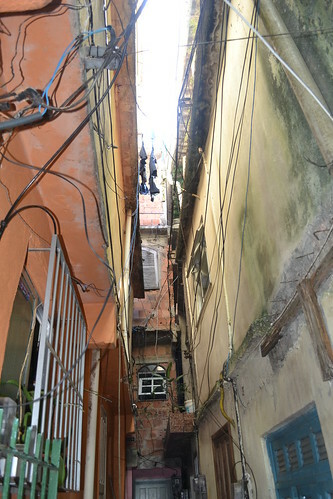 finally, the slums that surround guarulhos are perhaps the most surreal of all. guarulhos is the city that houses the sao paulo international airport—it has a propensity to fog up (my sao paulo host: that’s why they built the airport there [/irony]). i had to make several bus trips from guarulhos to sao paulo, often very early in the morning, and the landscape looks like that scene in terry gilliam’s brazil (appropriately) where very tall skyscrapers start bursting from the ground. skyscrapers seem to rise from the fog, but when it clears up you realize they are surrounded by slums—the demand for housing is so large that the slums are being replaced by skyscrapers, but there is no transition—they just seem to have landed in the middle of the seemingly infinite landscape of the slums. friends that visit me in guayaquil often question how can anyone live in the sight of such misery. perhaps it is the magnitude of the problem that makes it bearable—it disarms you. but the fact is, we all live with such misery: you, who may have never been in guayaquil, as much as i. we are all part of the global capitalist cycle that churns out slums in south america and in the rest of the world—some more evident than others.